Some of the best iOS games to have been released lately don’t fall neatly into one category of game. Many have tended to be a hybrid of two or more genres, taking some of the best bits and pieces of hit games and combining them to create a brand new blockbuster. Well it seems the folks at Firemint and Electronic Arts have taken notice of this trend and implemented it in their newest iPhone game, SPY mouse. SPY Mouse combines elements of timing, strategy, and resource management to create a game that feels part Cut the Rope, part Flight Control (also by Firemint). 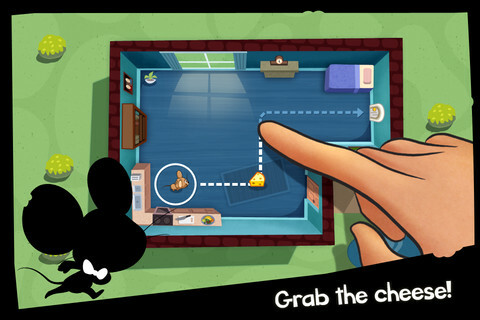 The goal of SPY Mouse is simple, guide the mouse to the piece of cheese and escape from the cat without being caught. To guide the mouse, simply draw the route you want him to take with your finger, and he’ll follow the exact line you put in place for him. If you’re familiar with Flight Control or Harbor Master, this mechanic will feel very familiar, yet it’s strange to be guiding a mouse instead of an airplane. As you progress through the more than 70 levels, you’ll be able to use power-ups, gadgets, and more to escape the cat’s claws with your cheese dinner. As has been the trend with so many “casual” iOS games, each level affords you the opportunity to earn three ribbons (thankfully, a departure from earning stars!). However, unlike Cut the Rope or Casey’s Contraptions, you don’t pass over the ribbons to earn them. Instead, ribbons are earned by completing pre-determined challenges on each level. For example, you might earn a ribbon for completing the level in under 20 seconds, or for causing the over-ambitious cat to run head-first into a wall. What’s unique about the ribbon earning process is that each objective doesn’t need to be accomplished in one attempt. In other words, you can focus one attempt on completing a time-limit ribbon, and then go through the level again to earn the points ribbon. It adds another dimension to SPY Mouse because you have to complete the same level using two or three different strategies to have a “perfect” level. Of course, with a name like “Spy Mouse”, there is an expectation of an espionage theme, and again here EA does not disappoint. Throughout the game, traditional “spy” music accompanies each level and the titular mouse features darting eyes and a genuinely sneaky personality that is entirely entertaining. The mouse looks like he’s taken lessons from James Bond as he evades danger and snags his cheese. Quite honestly, I love this game. It’s just the right mix of simple, silly, and strategic that makes the “casual” gaming craze so much fun. This is a casual game done right. 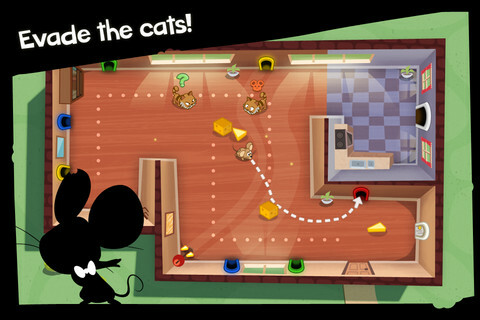 With simple controls, 70+ levels, and multiple goals to achieve on each level, SPY Mouse is an instant recipe for fun. Go ahead and grab it today, it’s now available in the App Store for $0.99. 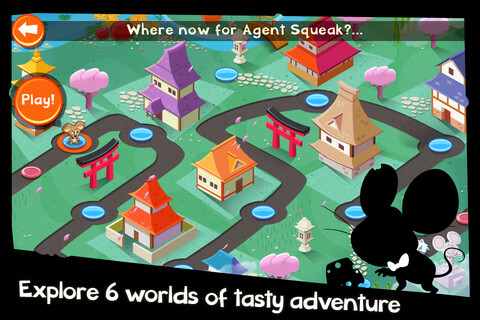 AppSafari review of SPY mouse was written by Alex Seiver on August 29th, 2011 and categorized under Action, Adventure, App Store, Featured, Games, Resource Management, Strategy. Page viewed 6580 times, 1 so far today. Need help on using these apps? Please read the Help Page.